Apple has officially notified the court that it will appeal this week's ruling denying the company's request for the external compliance monitor imposed as part of the government's e-book antitrust suit to be disqualified. The notice states that Apple intends to fight "all of the Court's rulings adverse to Apple in its January 16, 2014 Order, and the Court's modifications to the Plaintiff United States' Final Judgment." 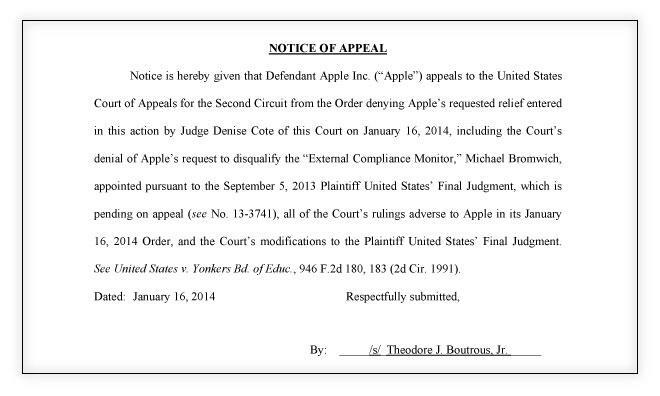 Theodore Boutrous of Gibson, Dunn & Crutcher, Apple's lead counsel in the case, submitted the notice on Apple's behalf. Apple's filing comes on the heels of a Monday hearing in which Judge Denise Cote rejected the company's motion to remove the court-appointed monitor, Michael Bromwich, from that post. Apple has taken issue with Bromwich's handling of the monitorship seemingly since the moment he was appointed, accusing him of conducting what the company feels is an overly-expansive, "roving" investigation and charging exorbitant fees. The deterioration of the relationship between Apple and the Monitor is unfortunate and disappointing. Hopefully, that relationship can be "reset" and placed on a productive course. But it is strongly in the public's interest for the Monitor to remain in place. A monitorship which succeeds in confirming the existence of a genuine and effective antitrust compliance program within Apple, is in the interest of not only the American public, but also Apple.